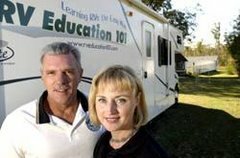 RV 101® Education with Mark Polk: Why Weigh your RV? Weighing your RV can be the difference between a safe, enjoyable trip and a costly, disastrous trip. With multiple slide out rooms, amenities like washers and dryers, large holding tank capacities and the ample amount of storage space available on today’s RVs it’s easy to see why so many are overloaded. Overloaded RVs are extremely dangerous. Actually there are a lot more reasons for weighing your RV than I listed here, but my intent was to highlight some of the most important reasons for weighing your RV. Note: When talking about weights and weighing RV’s there are some differences between motorized and towable RV’’s. This article is generic in nature and some terms and definitions for certain type RV’s are excluded. My goal with this article is to discuss weight issues that commonly apply to both categories of RV’s. 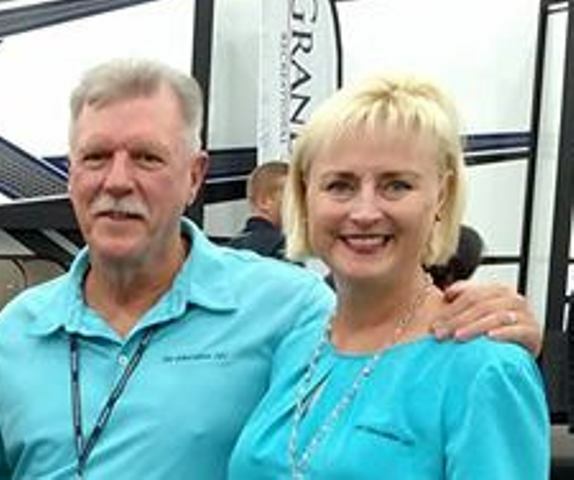 First and formost safety is the number one reason to weigh your RV. Driving or towing an overloaded RV is a leading cause for RV accidents. Overloading your RV puts you, your passengers and other people in harm’s way. Overloading RV’s is tough on the tires. The tires on your RV are the most vulnerable component affected by overloading the RV. There are numerous reasons for this. One reason is when the tires are not inflated properly for the load. Failure to maintain correct tire pressure can result in fast tread wear, uneven wear, poor handling, and excessive heat buildup, which can lead to tire failure. Another problem is, when you weigh your RV the total weight of the axles may be within the axles weight rating but it may be overloaded on one side of the axle or the other. For the sake of an example, let’s say you have an axle that is rated for 6,000 pounds. When we weigh the RV, the weight on that particular axle is 5,950 pounds. We are within the weight rating for the axle itself, but when we weigh each axle end separately we discover that one end weighs 3,400 pounds and the other end weighs 2550 pounds. We are still within the 6,000- pound axle weight rating, but the tires are rated for 3,000 lbs. at a specified psi. This means the axle end that weighs 3,400 pounds is overloading the tire by 400 pounds, even if the inflation pressure is correct. Eventually the overloaded tire will fail. Overloaded RV’s can result in suspension system and brake related problems. Overloading can lead to rapid vehicle suspension system wear, or component failure to include: springs, shock absorbers, brakes and tires. Overloading the RV increases the stopping distance and if serious overload conditions exist for extended time periods the brakes can fail completely. There is a reason RV’s have weight ratings. The suspension system, tires, wheels, brakes, axles, and the RV itself all have weight ratings. Weight ratings are established by the manufacturer, and are based on the weakest link in the chain. When you exceed a weight rating you are overloading one or more of the components on the RV and risk wearing the component out prematurely or complete failure of the component. 1) The Gross Vehicle Weight Rating (GVWR) is one of the most crucial safety factors for your RV. The GVWR is the maximum allowable weight of the vehicle when fully loaded for travel including, all passengers, all cargo, fluids and fuel. The GVWR is equal to or greater than the sum of the unloaded vehicle weight (UVW) plus the net carrying capacity (NCC) for the RV. 2) The Gross Axle Weight Rating (GAWR) is the maximum allowable weight that can be loaded on each axle of the RV. The GAWR is based on the lowest weight rating of other components in the system, like suspension components, brakes, wheels, and tires. 3) The Gross Combined Weight Rating (GCWR) is the maximum allowable combined weight of the fully loaded vehicle and the fully loaded vehicle/trailer being towed. It is dangerous to exceed any weight rating, and the only way to know is to have the RV weighed. Note: There are many other weight ratings for motorized and towable RV’s. Never exceed any weight rating. Poor Weight Distribution is a common problem with RVs. When weight is not properly distributed and/or the RV is loaded improperly the tire(s) and other components on the end of the axle that is overloaded are subject to failure. When a tire fails many RVers contribute it to a defect in the tire, but with overload conditions that is seldom the case. The only way to avoid this is to weigh each axle end separately to determine if a tire overload condition exists. If any overload condition exists it must be resolved immediately. In some cases it might be possible to redistribute the weight and then weigh it again. If the overload condition still exists you will need to remove some of the weight from the RV. Overloading can result in untimely breakdowns and costly repairs. When an overload condition exists components on the RV can wear out prematurely. Transmissions overheat, brakes wear out, tires fail and the end result can be an unexpected and sometimes dangerous breakdown. These situations can often times be avoided by knowing and managing the weights in and on your RV. Overloading your RV is unsafe! That’s the bottom line. That’s some pretty convincing reasons for weighing your RV, but just how do you go about it? The actual process of weighing your RV is not that difficult. It may take a little time at the scales, but it is well worth it knowing that you are traveling safely within all weight ratings. The first step is to find scales where you can weigh your RV. This shouldn’t be a problem; you can look in the Yellow Pages under moving and storage companies, gravel pits and commercial truck stops. There are several different kinds of scales. What is important is to find scales where you can weigh individual wheel positions in addition to the overall weight, and the axle weights. Remember we said earlier it is quite possible to weigh an axle and be within the Gross Axle Weight Rating, but you can exceed the tire rating on one axle end or the other. Call the number where the scales are located and ask them if it is possible to weigh your RV in these configurations. The next step is to weigh everything! The day you head to the scales have the RV fully loaded for travel. If you tow a vehicle or trailer behind the motorhome take the loaded vehicle with you. If it’s a tow vehicle and trailer have it loaded as if you were leaving on a camping trip. Be sure to include all passengers, cargo, food, clothing, fuel, water, and propane. I am including a link to a brochure that you can download, print and take with you to the scales. It will walk you through the proper procedures for weighing your RV. Always keep in mind that weights (over time) can and do change according to how you load and distribute the weight in your RV and on many other factors. You should get in the practice of weighing your RV periodically to stay within all weight ratings. Whenever an overload condition exists resolve the problem before using your RV.